We’re very excited to announce the release of WP Migrate DB Pro 1.5 and the all-new Multisite Tools addon. We’ve already cheated a little by giving you a video preview of the Multisite Tools addon in action, but there’s some other new stuff that I’d like to show you as well. Some web hosts run Denial of Service (DoS) software to protect against attackers who send a barrage of simultaneous requests to the server at once in an effort to take it down. Sometimes that software incorrectly identifies WP Migrate DB Pro’s requests as malicious and blocks future requests. The fix is to slow down the migration, adding a delay between each of the requests. The Delay Between Requests slider allows you to do just that. We’ve added a WP-CLI export command to the core plugin. You will still need our CLI addon to run a push/pull from the CLI, but to run an export you only need the core plugin. See our documentation for more details. Often times you need to copy the Find value over to the Replace value and edit it. We’ve made the arrow a button so it’s now only one click to do this. A convenient little enhancement. Hat tip to Jonathan Perlman for requesting this feature. We’ve spent quite a lot of time tightening up security in this release. We’ve greatly reduced the data passed through each HTTP request. We’ve also audited all our input variables and made sure they are all sanitized before being used. 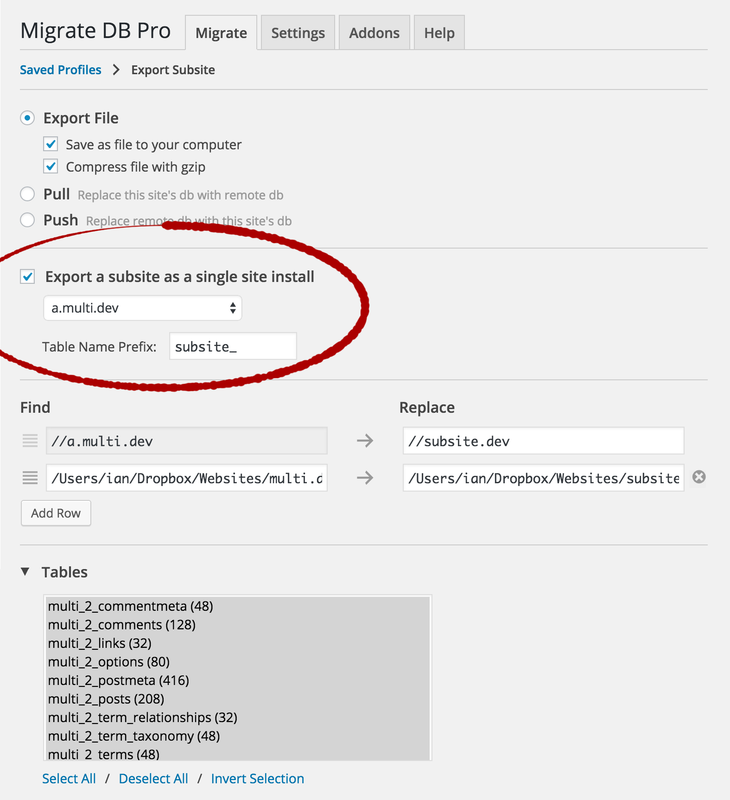 This first release of the Multisite Tools addon has the ability to export a subsite from a multisite install as an SQL file that is ready to be imported as a single site. We are planning to support other types of multisite migrations, so check out our documentation for more on that as well as details on how it works. Also, if you haven’t already, be sure to watch the following video where Ian guides you through using it. All customers with an active Developer license or better can install and activate the new Multisite Tools addon from the Addons tab within the plugin (after updating WP Migrate DB Pro to 1.5). You can also download the zip from there or login to My Account and download the zip there. Update not showing in your dashboard? If the update isn’t showing in your dashboard right away, you can click the “Check Again” button on the Updates page and it will clear the cached update check and force it to check our server for new updates. We have some minor fixes to take care of that didn’t make it into 1.5, then we’re going to get started on 1.6 which will be a big UI update. The 1.5 release did balloon on us and took much longer than it should have. We’ve recognized this and will be much more disciplined about limiting the scope of all major releases going forward so that we can push one out every 3-4 months. This entry was tagged WP Migrate DB Pro, Plugin, New Release, Bug Fixes, New Features, Addons, Multisite Tools Addon.